I finished my own personal Ravelympics project on Sunday night while watching the hockey game. 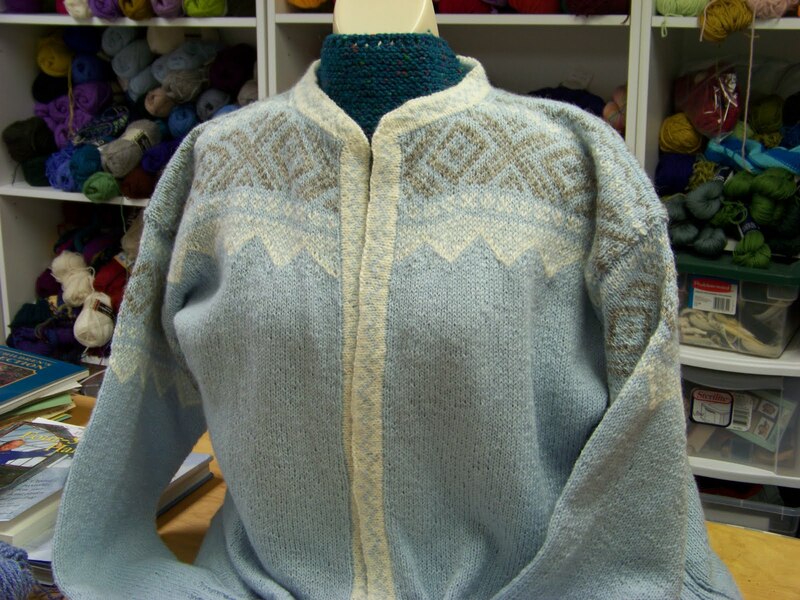 I love to knit the Norwegian Ski Team’s Olympic sweaters for the games or as close to the games as I can. I am not being unpatriotic. 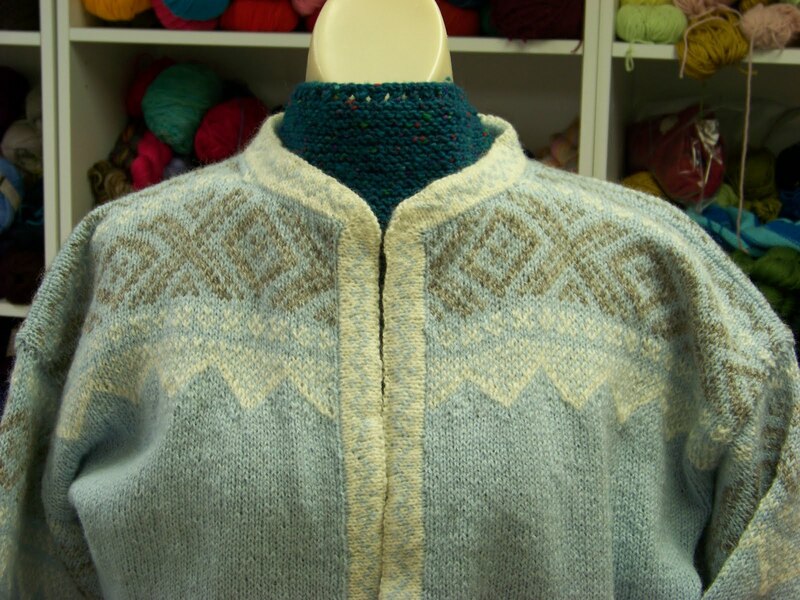 I would knit the American Ski teams sweater and probably will now that I have seen a glimpse. It is just that the Norwegian Ski Team sweater is usually a real knitting challenge. I also did Lillehammer, but gave it away to the American Red Cross for a fund raiser that year. So I don’t have a picture. I didn’t join any of the official Ravlympic teams because I started my project before the Olympics began. 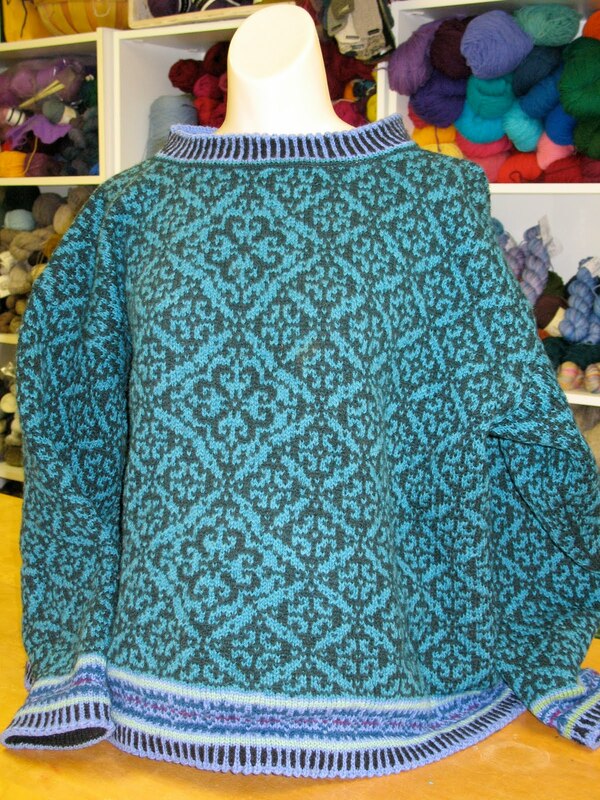 My intention was to have this sweater finished in time to wear it while I cheered on the athletes, from my living room. I took the Norwegian Ski Team sweater and did my own thing. I wanted a cardigan because I am a woman of a certain age and find cardigans more flexible for my lifestyle. I also changed the wool. Now before the big reveal I want to prove that I can knit with the yarn I chose and the garments have turned out lovely in the past. I knit this beauty for a good friend and she loves it. It looked exactly like I imagined it would and all was right with the world. Here is another I knit for myself out of the same yarn. 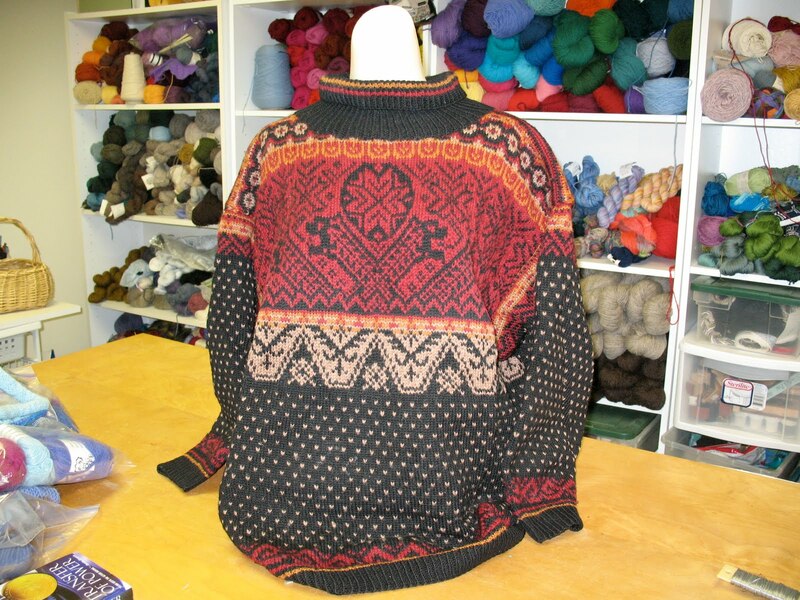 It is again a very nice sweater, extremely warm and cozy. 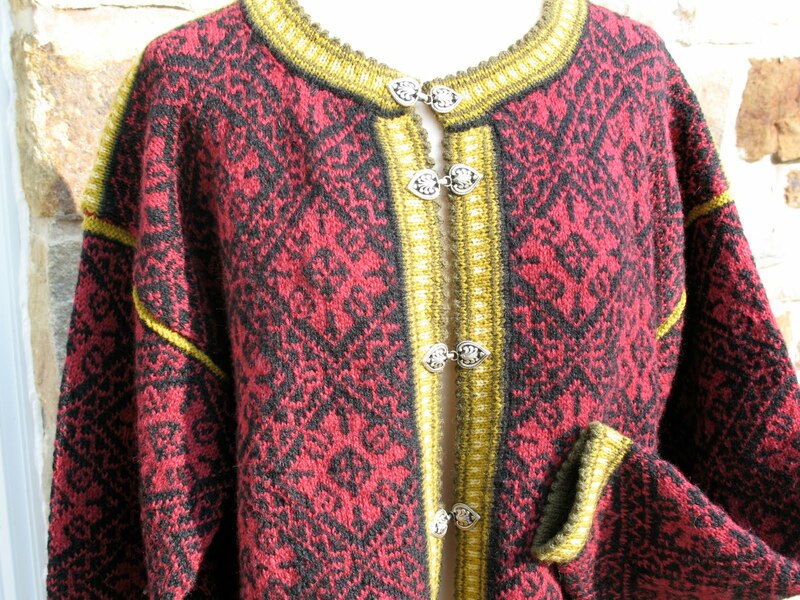 And here is one I wear at least twice a week in the winter and have for years and it is wearing quite well. This is all to say I have never had a problem with this yarn, in fact I have always been more than pleased with the outcome. This time, not so much. 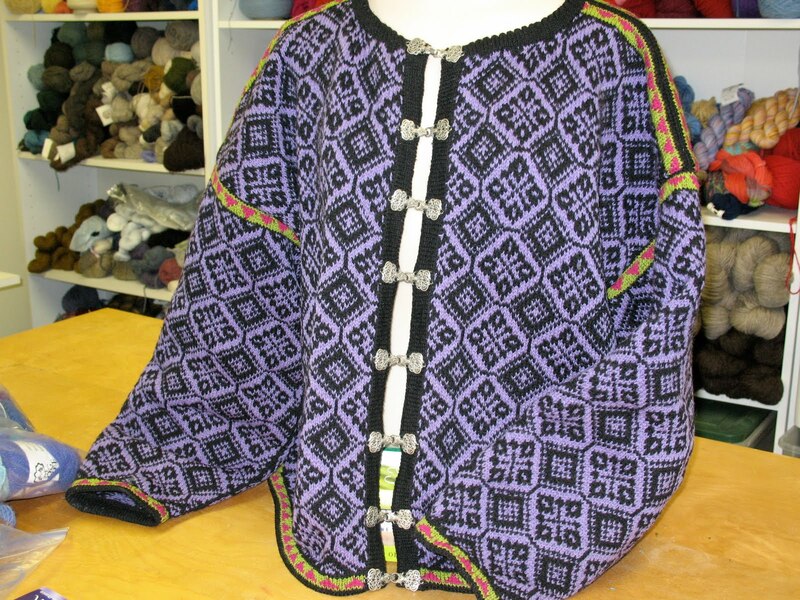 I think the problem is the incredible amount of plain stockinette stitch with no color work until the yoke area. All the plain, one color stockinette looks sloppy and every stitch shows in an unflattering light. I don’t know if I had gone down another needle size if that would have made a significant difference. I just don’t know what the issue is but I am not pleased. I didn’t use the Dale yarn that was called for and I am not regretting that decision but I am not happy with the fabric I created for this sweater. That being said, I love how this fits me, so there is an up side. Oh, and the color looks good on me too. and look at how well the fronts match, always important, so visible. Kinda blah don’t you think? I will wear it, because it fits so well, but I am disappointed. I don't know, it sure looks good to me. I love the main color, too. Thanks Carol, means a lot coming from you. Sorry you are disappointed, but I love the colors; they are subtle and understated and quite sophisticated. More of a Bohus color scheme rather than the usual Olympics bright colors. I especially like the way the cream color works over the blue – it almost looks like lace work. Reminds me of powdered sugar dusted through a doily over a freshbaked cake.